Arafah M, Zaidi SN, Kfoury HK, Al Rikabi M, Al Ghamdi K. The Histological Spectrum of Early Mycosis Fungoides: A Study of 58 Saudi Arab patients. Oman Med J 2012 Mar; 27(2):134-139. 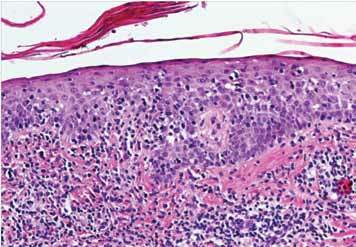 Keywords: Mycosis Fungoides; Dermatoses; Patch stage of mycosis fungoides; Histopathology. The purpose of the present study was to assess the frequency and significance of the different pathological parameters that are seen in Saudi patients in early MF. These parameters when identified can also be used to differentiate between early MF and various inflammatory dermatoses. 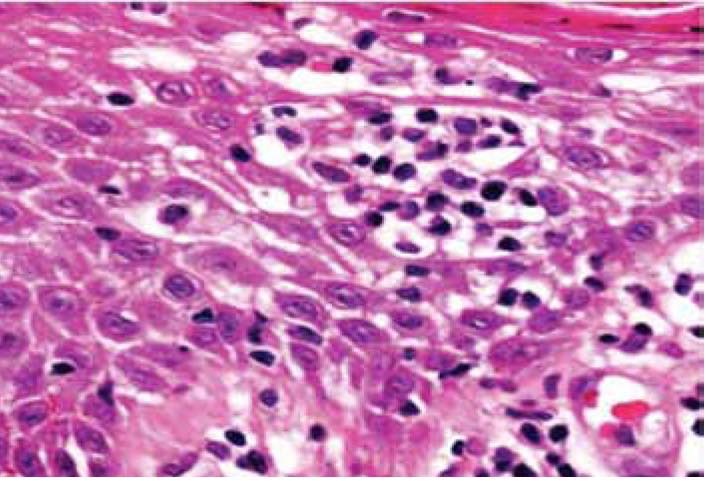 Sixty-six skin biopsies generated from 58 patients who had either clinically suspicious MF lesions or were clinically diagnosed as being in the early patch stage of MF were reviewed. The cases were retrieved from the archives of the department of Pathology at King Khalid University Hospital, Riyadh, and included all cases between the years 2002 and 2006. The final diagnosis of MF was confirmed in all the cases either by correlation with the clinical features or by the presence of histological findings regarded to be characteristics of MF. Punch biopsies were taken at the onset of the disease or from recurrent patches, after stopping all topical treatment including PUVA therapy at least 2-4 weeks prior to the biopsy. The biopsies were fixed in buffered formalin, routinely processed and stained with Hematoxylin and Eosin stains. A person not taking part in the histological evaluation randomly numbered the slides from 1-66. Each slide was then independently reviewed by the two participating histopathologists and one dermatopathologist. 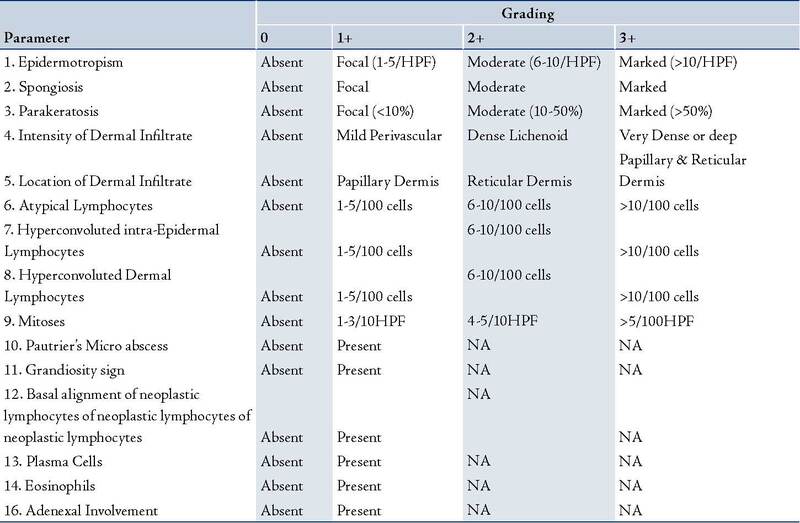 A total of 16 histological criteria were assessed and each criterion was graded semi-quantitatively (0, 1+, 2+, 3+), (Table 1). For any of the criteria to be considered as present, it was mandatory to be graded as 1+ or above. Figure 1: Infiltrate of atypical lymphocytes along slightly expanded papillary dermis, extending upwards and colonizing in the epidermis (Epidermotropism). Figure 2: Collection of lymphoid cells in the epidermis with no significant cytopathic changes in the surrounding keratinocytes (Pautrier’s micro abscess). The data were analyzed using statistical software STATA version 10 for windows. The univariate analysis was performed on each morphological criterion by the chi-square or Fisher’s exact test. A p-value of less than 0.05was considered significant. For each histological test, sensitivity, specificity, predictive values, and likelihood ratios were calculated with the groups with confirmed MF and negatives using the "diagt" STATA procedure. Logistic Regression analysis was used to study the association between mycosis fungoides and selected histological parameters. Sensitivity is the likelihood that a diseased patient has a positive test, while specificity is the likelihood that a healthy patient has negative test. The predictive value of test positive is the likelihood that a person who tests positive has the disease, while the predictive value of test negative is the likelihood that a person who tests negative does not have the disease. The likelihood ratio (LR) compares the probability of obtaining a correct test result with that of containing an incorrect test result for positive and negative test results, respectively. LR positive = (Sensitivity/1-specificity); LR negative=(1-sensitivity)/specificity. LR above or below 1 increases or decreases the likelihood of the disease, respectively. Sixty-six slides generated from 58 patients were received. In six patients, a repeat biopsy and in one patient, three repeat biopsies were required to reach the final diagnosis. The age of the patient in the different groups was between 5-74 years; while the male to female ratio was 1.9:1 (38:20). Five of the studied patients who were diagnosed as being in the patch stage were children less than ten years of age. The results of the histological evaluation of sixty-six slides are summarized in Table 2, along with the specificity and sensitivity, positive predictive value, negative predictive value and likelihood ratio calculated for each recorded feature. Of these, 38 cases were clinically and histologically confirmed for patch stage MF. Among the remaining 28 cases which were not clinically confirmed, twenty were suspicious of MF and were advised careful follow up. Eight cases were negative for MF on histology. These negative cases were diagnosed based on clinic-pathological correlation as drug reaction (three cases), psoriasiform dermatitis (two cases), pruritic dermatosis (two cases) and pityriasis alba (one case). The histological criteria that were useful for discriminating inflammatory and patch stage lesions of MF as documented by the univariate and multivariate statistical analysis are summarized in Table 2. The statistically significant criteria (p<0.05) used for differentiating cases which were negative for MF from the confirmed patch stage cases of MF included dermal fibrosis, hyperconvoluted epidermal and dermal lymphocytes, grandiosity sign, Basal alignment of neoplastic lymphocytes and Pautrier’s micro abscesses. These findings emphasize the importance of both cytological and architectural features in the diagnosis of MF. Table 1: Grading of histologic parameters during the assessment of suspected Mycosis Fungoides. Table 2: Histological features of Mycosis Fungoides (MF; n=38), suspicious for mycosis Fungoides (n=20) and non mycosis Fungoides (n=8) with sensitivity, specificity, positive predictive value, negative predictive value and likelihood ratio. All association and diagnostic tests were done using patch MF and non-MF. PPV- positive predictive value; NPV-negative predictive value; LR-likelihood ratio; ‡ p-values were obtained using chi-square. The criteria that were moderately sensitive and highly specific for MF included Pautrier’s micro abscesses and grandiosity sign. Basal alignment of neoplastic lymphocytes also showed a high degree of sensitivity with moderate specificity. Pautrier’s micro abscess and basal alignment were the two histological parameters significantly associated with mycosis fungoides in both unadjusted and adjusted logistic regression analysis. There were higher odds of MF in these two histological parameters with positives compared to the negatives. In this study, we did not focus on the establishment of new histopathological criteria for the diagnosis of early MF, but merely recorded the patterns observed in Saudi patients who had MF confirmed by clinico-pathologic correlation. The findings were compared with those published in international medical literature and a systematic evaluation of many previously reported criteria deemed to be useful in distinguishing MF from its inflammatory simulators was performed.15 By strictly defining the criteria before initiating a comparison, the inter and intra observer disagreements often encountered during histological evaluations were minimized. In agreement with previous studies; spongiosis, parakeratosis intensity and location of dermal infiltrate were all seen in variable numbers, both in the patch stage of MF and in inflammatory skin lesions.13,15 This indicates that the presence of these features is not very supportive for the diagnosis of MF. Plasma cells and eosinophills were uncommon in the dermal infiltrate during the patch stage of MF. Eosinophills were however, detected more frequently in inflammatory dermatoses. The current study showed that hyper-convoluted epidermal and dermal lymphocytes proved to be a discriminatory factor with high sensitivity and specificity. This was further supported by higher predictive values and the high and low likelihood ratio values of positive and negative, respectively. This finding is in agreement with the EORTC classification,13 which concluded that the presence of single or clusters of medium to large sized cerebriform cells in the epidermis or dermis is the single most useful histologic criterion for establishing a diagnosis of early MF. Overall, there is no doubt that the histopathologic differentiation between early MF lesions and non-MF cases is one of the most challenging areas in skin pathology. To rely on any single histopathologic feature only in the diagnosis of early MF is incorrect. This study proved that the presence of hyperconvoluted lymphocytes in the epidermis and dermis proved to be a highly reliable feature, if used in conjunction with epidermotropism, Pautrier’s micro abscess, grandiosity sign and lymphocytic Basal alignment of neoplastic lymphocytes. Thus, sequential and multiple site biopsies as well as meticulous follow-up of younger patients in whom the histopathological diagnosis is in doubt are also recommended. This constitutes a better approach instead of rendering a hasty diagnosis in such cases. 1. Alibert JL. Description des Maladies de la Peau: Observees l'Hospital St. Louis et Exposition des Meilleurs Methods Suiview pour leur Traitement. Paris. In: Barrois l'aine et Fils, 1806. 2. Whittaker S. Biological insights into the pathogenesis of cutaneous T-cell lymphomas (CTCL). Semin Oncol 2006 Feb;33(1)(Suppl 3):S3-S6. 3. Shin J, Monti S, Aires DJ, Duvic M, Golub T, Jones DA, et al. Lesional gene expression profiling in cutaneous T-cell lymphoma reveals natural clusters associated with disease outcome. Blood 2007 Oct;110(8):3015-3027. 4. Rosen ST, Radvany R, Roenigk H Jr, Terasaki PI, Bunn PA Jr. Human leukocyte antigens in cutaneous T cell lymphoma. J Am Acad Dermatol 1985 Mar;12(3):531-534. 5. Hodak E, Klein T, Gabay B, Ben-Amitai D, Bergman R, Gdalevich M, et al. Familial mycosis fungoides: report of 6 kindreds and a study of the HLA system. J Am Acad Dermatol 2005 Mar;52(3 Pt 1):393-402. 6. Criscione VD, Weinstock MA. 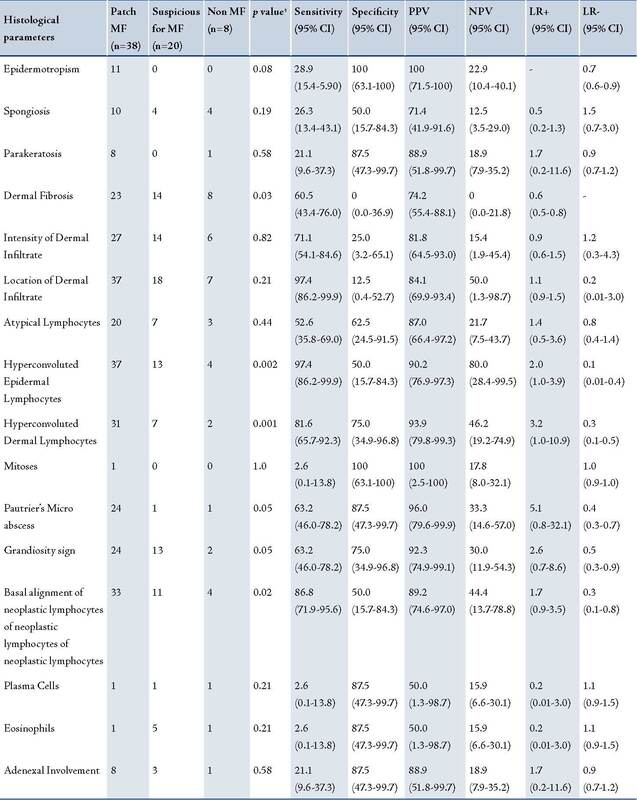 Incidence of cutaneous T-cell lymphoma in the United States, 1973-2002. Arch Dermatol 2007 Jul;143(7):854-859. 7. Yeh YA, Hudson AR, Prieto VG, Shea CR, Smoller BR. Reassessment of lymphocytic atypia in the diagnosis of mycosis fungoides. Mod Pathol 2001 Apr;14(4):285-288. 8. Glusac EJ. Criterion by criterion, mycosis fungoides. Am J Dermatopathol 2003 Jun;25(3):264-269. 9. Inchara YK, Rajalakshmi T. Early mycosis fungoides vs. inflammatory mimics: how reliable is histology? Indian J Dermatol Venereol Leprol 2008 Sep-Oct;74(5):462-466. 10. Bergman R, Faclieru D, Sahar D, Sander CA, Kerner H, Ben-Aryeh Y, et al. Immunophenotyping and T-cell receptor gamma gene rearrangement analysis as an adjunct to the histopathologic diagnosis of mycosis fungoides. J Am Acad Dermatol 1998 Oct;39(4 Pt 1):554-559. 11. Pimpinelli N, Olsen EA, Santucci M, Vonderheid E, Haeffner AC, Stevens S, et al; International Society for Cutaneous Lymphoma. Defining early mycosis fungoides. J Am Acad Dermatol 2005 Dec;53(6):1053-1063. 12. Nashan D, Faulhaber D, Ständer S, Luger TA, Stadler R. Mycosis fungoides: a dermatological masquerader. Br J Dermatol 2007 Jan;156(1):1-10. 13. Santucci M, Biggeri A, Feller AC, Massi D, Burg G; European Organization for Research and Treatment of Cancer. Efficacy of histologic criteria for diagnosing early mycosis fungoides: an EORTC cutaneous lymphoma study group investigation. Am J Surg Pathol 2000 Jan;24(1):40-50. 14. Parker SR, Bethaney JV. Cutaneous T cell lymphoma-mycosis fungoides and Sezary syndrome: an update. G Ital Dermatol Venereol 2009 Aug;144(4):467-485. PubMed. 15. Smoller BR, Bishop K, Glusac E, Kim YH, Hendrickson M. Reassessment of histologic parameters in the diagnosis of mycosis fungoides. Am J Surg Pathol 1995Dec;19(12):1423-1430. 16. Shapiro PE, Pinto FJ. The histologic spectrum of mycosis fungoides/Sézary syndrome (cutaneous T-cell lymphoma). A review of 222 biopsies, including newly described patterns and the earliest pathologic changes. Am J Surg Pathol 1994 Jul;18(7):645-667. 17. Caro WA. Biopsy in suspected malignant lymphoma of the skin. Cutis 1978 Feb;21(2):197-201. 18. Naraghi ZS, Seirafi H, Valikhani M, Farnaghi F, Kavusi S, Dowlati Y. Assessment of histologic criteria in the diagnosis of mycosis fungoides. Int J Dermatol 2003Jan;42(1):45-52. 19. Sanchez JL, Ackerman AB. The patch stage of mycosis fungoides. Criteria for histologic diagnosis. Am J Dermatopathol 1979;1(1):5-26. 20. Nickoloff BJ. Light-microscopic assessment of 100 patients with patch/plaque-stage mycosis fungoides. Am J Dermatopathol 1988 Dec;10(6):469-477. 21. Ackerman AB. An algorithmic method for histologic diagnosis of inflammatory and neoplastic skin diseases by analysis of their patterns. Am J Dermatopathol 1985Apr;7(2):105-107. 22. Massone C, Kodama K, Kerl H, Cerroni L. Histopathologic features of early (patch) lesions of mycosis fungoides: a morphologic study on 745 biopsy specimens from 427 patients. Am J Surg Pathol 2005 Apr;29(4):550-560. 23. Cho-Vega JH, Tschen JA, Duvic M, Vega F. Early-stage mycosis fungoides variants: case-based review. Ann Diagn Pathol 2010 Oct;14(5):369-385.